As leading online retailers know, good photography increases conversion and improves customer satisfaction. Even though investing in high-quality product shots is now becoming a mantra for ecommerce marketers, a large amount of fashion retailers could benefit from expanding beyond conventional product imagery. For a long time, ecommerce photography has revolved exclusively around the product. Items displayed against a white backdrop, mannequins, and standard modeling poses are often indicative of a traditional style that refrains from distracting consumers. While these techniques are still important to facilitate the creation of convenient, detailed, and consistent photos, online merchants are experiencing greater engagement rates when incorporating lookbook images that embody a lifestyle. That said, how can merchants ensure that their lifestyle imagery is driving engagement? Is there a pattern behind highly engaging photos? How important are variables such as color, settings, and portrayed subjects? To answer these questions, Corra conducted a study aimed at providing fashion retailers with a series of clear, data-based guidelines that can be leveraged when planning product shoots or selecting lifestyle photography for online commerce. To measure image-driven engagement, Corra has leveraged the world’s favorite image-sharing app: Instagram. We gathered over 200,000 images released by 200 popular fashion brands. We then ran the images through Google’s Cloud Vision API, a tool built to analyze and identify key image features. 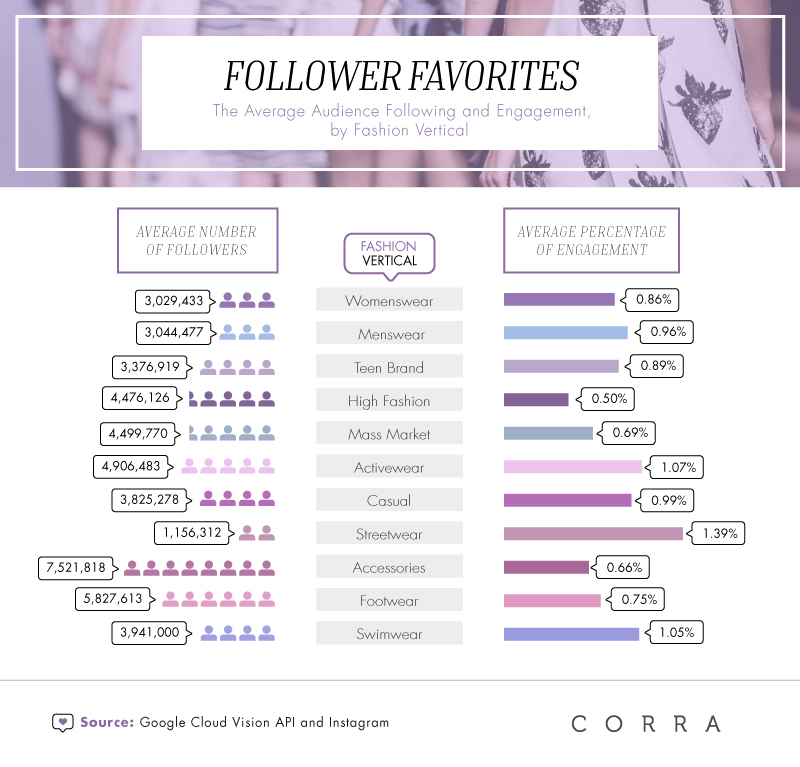 Then, we grouped them into specific fashion verticals and, using their performance statistics on Instagram, pinpointed the recurring features that drove most engagement. Finally, in order explain the visual phenomena yielded through these images, we gathered input from Chelsie Pouliot, Senior Visual Designer at Corra. Chelsie was able to offer educated and experienced opinions as to why certain photographic themes are impacting audience engagement with brands and their respective verticals. 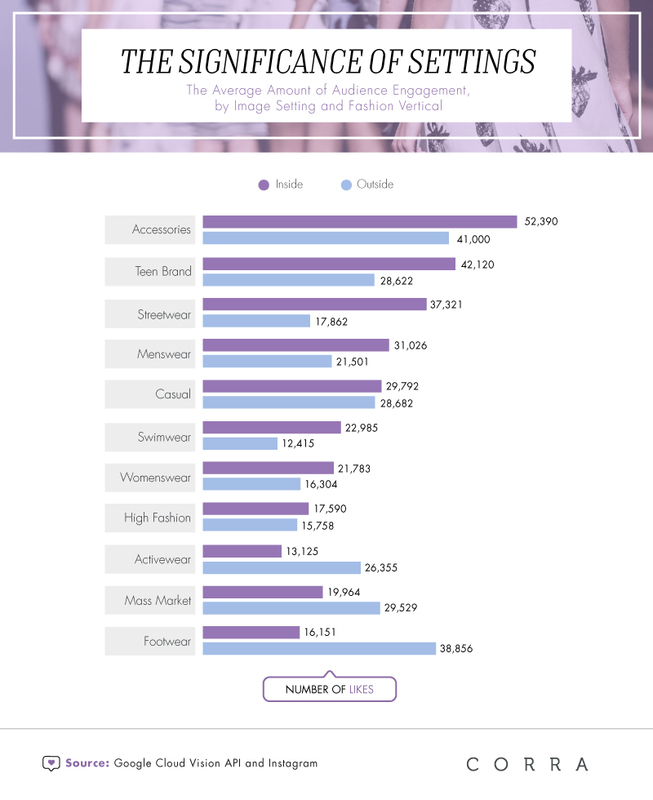 Audience size is not indicative of highest engagement metrics. All brands, regardless of their popularity, can take actionable steps to connect with their consumers through photography. For instance, although the streetwear vertical had a limited audience size, it was also the most successful in terms of engagement. Even brands that are not leaders in their respective vertical can increase their engagement rates through a set of successful image themes. In the following sections, we will explore these styles, colors, and settings. Countless studies and infographics have tried to connect colors with hyper-specific consumer reactions. Despite these efforts, research shows that personal experiences, gender, age, and culture influence how individuals perceive them. Although colors can’t be translated into universal buying behaviors, they do play a crucial role in communicating the “personality” of a brand. Audiences seem to understand how brands are trying to position themselves, and react positively when they perceive appropriateness. Our study attempted to identify the shades that better “fit” the verticals we analyzed. Photos containing the color black seem to drive stronger engagement when utilized by footwear and swimwear verticals. Black is also popular in the activewear vertical, only topped by pink. Black inspires confidence, and this success doesn’t come as a surprise. However, black has the opposite effect when included in photography for streetwear and high fashion. For these segments, red, orange, and pink are effective colors. 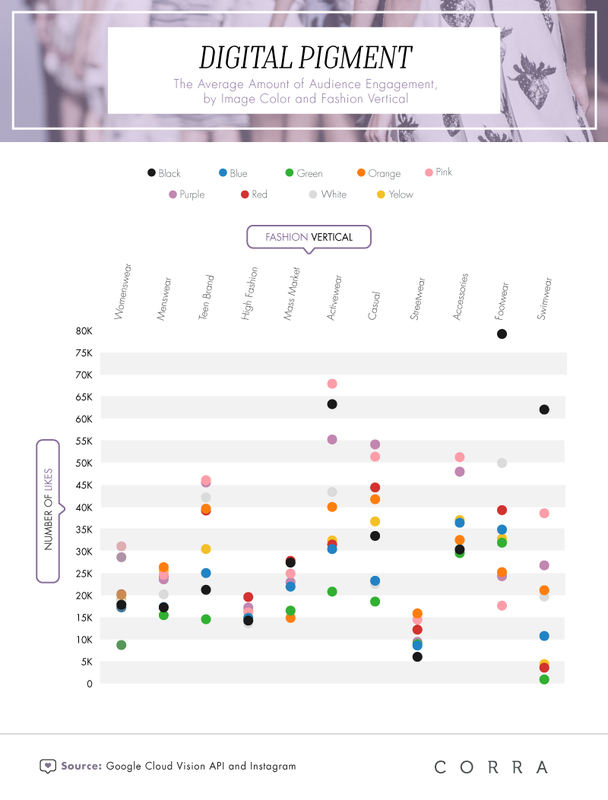 Generically speaking, pink, purple, and white are the most engaging, regardless of verticals. Greenery was Pantone color of 2017, our study showed that green negatively affects the engagement of all customers’ categories. Although shooting in studios is more practical, brands should consider showing their products in action. Outdoor settings drove engagement to nearly all verticals analyzed, and were remarkably effective within the footwear category. Shots featuring an outdoor setting received an average of nearly 39,000 likes, compared to just over 16,000 likes for posts featuring an indoor environment. The success of the setting is not necessarily related to the nature or category of the product. For example, although swimwear is meant to be worn in open-air environments, indoor posts received over 10,000 more likes than those featuring an outdoor setting. Location wasn’t the only aspect of an image that affected user engagement. The gender of the featured model is also influencing customer reactions, sometimes in unexpected ways. 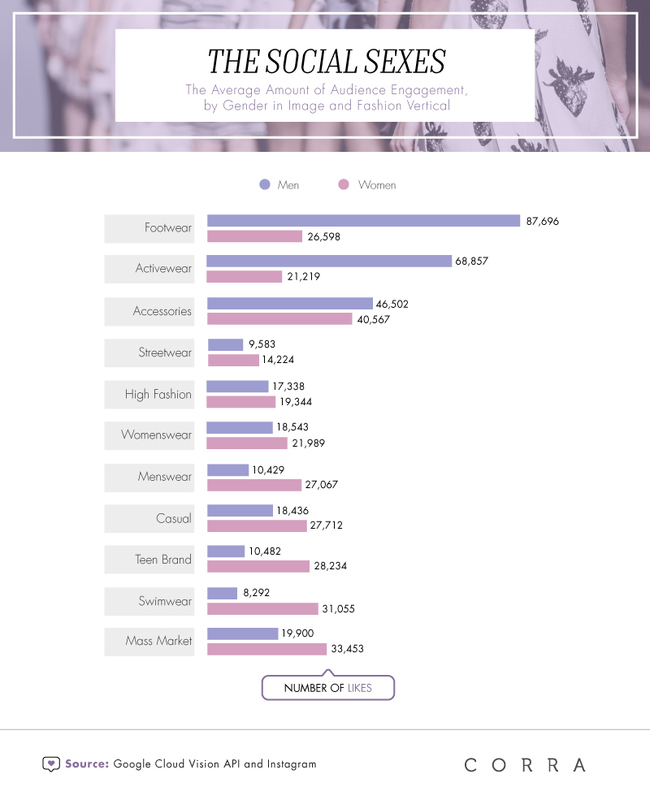 Male models boosted engagement for the footwear, activewear, and accessories verticals, and the rest of the segments analyzed benefitted from showcasing female models. Images of menswear resulted in more engagement when representing a female model. 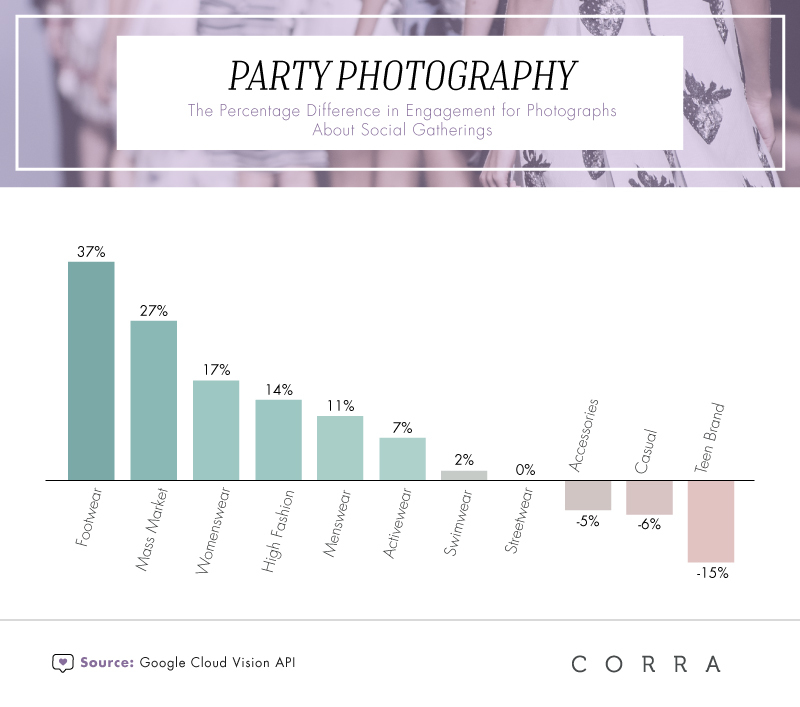 most fashion verticals achieved better engagement rates when photos portrayed social gatherings. Only teen brands, accessory, and casual verticals seemed to benefit from photography that strayed from the party. 1. Most fashion retailers assume that blank background pictures are the standard. However, only lifestyle photography allows users to relate to the brand, see items in real-life settings and, ultimately, remain interested in the pages they are scrolling. 2. Lifestyle photography portrays people, events, and diverse scenarios. Although its variables are infinite, fashion merchants can incorporate the features we discussed to test new ways to engage with consumers through images. After selecting 11 fashion verticals to analyze, we gathered Instagram handles for 200 fashion brands. Fashion brands could belong to more than one vertical (e.g., an accessories brand could also be categorized as high fashion). We then grouped the 100 most recent Instagram posts from each brand, creating a total of 200,000 images. We recorded details about every image, including the average number of likes. Every image was then run through Google’s Cloud Vision API, which generated more granular descriptors for each post. These descriptors were used to create the categories of images we used for this campaign. Lastly, we compared average likes and engagement for each type of category. Crediting is required to use these images and content for noncommercial purposes. In order to give the authors proper credit, please embed a link to this page.